When it's time to sit down for Thanksgiving dinner, there's hardly anything the host hates more than everyone trying to figure out where to sit. It can take several minutes--especially for big families--to sort out who should sit next to whom. Meanwhile, the mashed potatoes get cold. There's a simple solution to this annoyance: use place cards. Place cards aren't just for weddings and big, fancy dinner parties. They are a simple way to make holiday dinners a little less chaotic. Plus, the personalized touch makes guests feel special. Thanksgiving is an especially good time to use place cards because they can also give you and your friends and family the opportunity to share what you're each thankful for. There's a lot to do when hosting Thanksgiving dinner, however, so place cards should not be complicated. 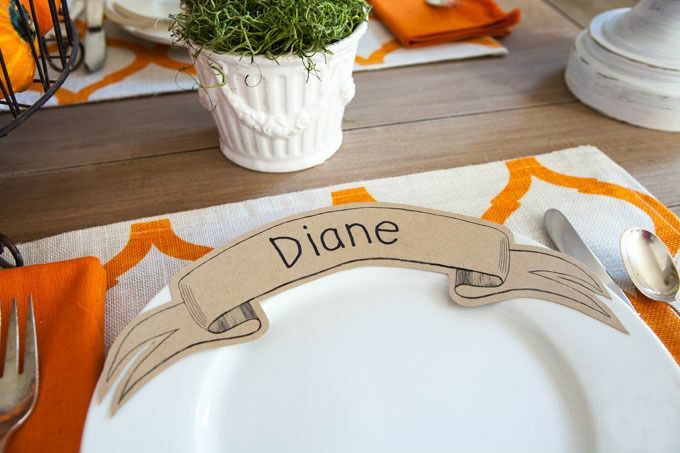 Sort out your seating as simply as possible by using free, printable place card templates. Here are 17 options to inspire you and help personalize your Thanksgiving tablescape. Now all that's left to do--besides cook the turkey--is figure out where everyone should sit. There's no need for place card holders thanks to this clever design. Print and cut out kraft paper ribbons to arch over each plate and your guests will have no problem finding their seat. These simple, oval place cards are adhered to toothpicks and inserted into mini pies for a personalized dessert. As an alternative, these labels could also be tied onto cloth napkins or simply laid on a plate. Although this place card template requires some folding, the effect is worth a little extra effort. This 3-D slice of pumpkin pie hides a sweet surprise at each place setting...it can be filled with candy! With just a little scissor work, acorns and pumpkins stand out from the top of this place card. The cards then get folded and glittered to add a little bling to the holiday table. These colorful place cards would look beautiful on a simple Thanksgiving tablescape set with white dishes and a fall centerpiece. The autumn leaf pattern may be just the pop of color you need to tie everything together. If your tastes lean towards traditional, try this simple place card template featuring a handsome turkey that will match a set of Spode dishes perfectly. This place card template allows you to type in the letters of each guest's name before printing. After cutting out each flag and assembling the names as bunting on a length of string, you'll have a whimsical way to show guests where to sit. A little assembly is required for this turkey place card as well; however, the kids can help with this one. Print out and color the shapes, then use the tail feathers to tell each of your guests why you're thankful for them. If you don't have nice handwriting, try an editable place card template like this one. Simply type the names into the file before printing them! Use any color of card stock to match your table's theme. This colorful feather motif with a chevron pattern will lend a modern touch to any Thanksgiving table. Use novelty place card holders to elevate these pretty cards even more. Speaking of feathers, check out this idea. Craft cute feather pencils as party favors, then use the place card as a way to display them. Guests can write down what they're thankful for, then share their thoughts throughout dinner. This pretty place card template sports modern fall florals on a dark background, which will really pop against white plates. Download and print these pretty leaf shapes to use as place cards. You can lay these right on top of each plate, or punch a hole in them to string them around a napkin, a wine glass, or even small pumpkins or gourds. This leaf place card template is simple and elegant. A dusting of color around the edge, and a simple fold in the middle gives it dimension. Tie on a couple of acorns for a touch more natural beauty. Here's another place card template that lets you personalize each one before printing the set. Leaves and berries adorn this tent card, along with a simple reminder to "Give Thanks." Have a kids' table? Use these playful turkeys to tell all of your little pilgrims where to sit. This way, you'll be able to separate the more mischievous cousins from one another. This place card doubles as a napkin holder. The kraft paper cuffs can be customized before printing, then slip effortlessly over a table setting to keep things organized and elegant.